Bologna is known for its food. In English, the name is synonymous with slices of large sausage named after the city. The city has earned this reputation well. If you like to eat, and eat Italian, Bologna is the place to be. Food is never very far away in Bologna. This is one of the reasons I like the city. Check under the porticos and down side streets, but in the center of the city you are not far from food and it makes itself easy to be found. 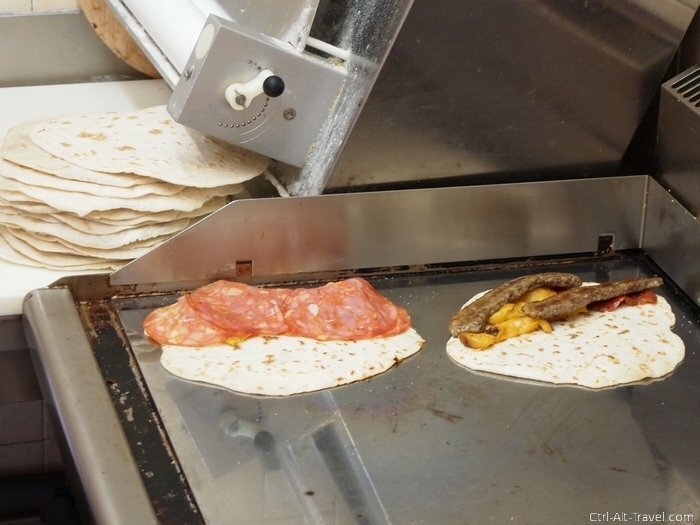 Piadina bread is, for me, somewhere between a pide and a tortilla. It is fluffier and thicker than a tortilla, but still solid so that the meat and such go on the outside, not stuffed inside. They are common in the region as are the little shops that sell them as sandwiches. It comes hot, filled and folded over. Another blogville blogger from last year posted a recipe. My favorite place was in Via Del Moline near the corner of Via Oberdan. What you have probably seen everywhere in the world called “Bolognese sauce” is in its home city called Ragu, and it is on tagliatelle, definitely NOT on spaghetti. Check out Ali’s post on how to make this Bolognese dish. Tiny tortellini less than an inch across filled with meat floating in a meat broth. This is a dish that is very Bolognese and doesn’t seem to get much recognition outside of Italy. I like it. Italians tend to eat dinner late. Apertivo is kind of the meal before dinner. It runs somewhere between 6pm and 9pm depending on the place. You buy a drink which is a little more expensive than normal and get snacks to go with it. This is a tradition all over Italy, but is at its best in Bologna. In some places, mostly in the university quarter, the snacks means a full buffet of warm and cold food. It really depends on the place, but pizza squares, rice dishes, cheese, several forms of potatoes and salads were common. In other places it could just be a dish of mixed nuts or cheese. Definitely look for the buffets and the crowd of students which frequent the good ones. The Bounty was our favorite place for this. It is also in Via Del Moline near Via Del Borgo. If you have an apartment or hostel with a kitchen, Bologna offers up its freshness in the market district just steps from Piazza Maggiore. 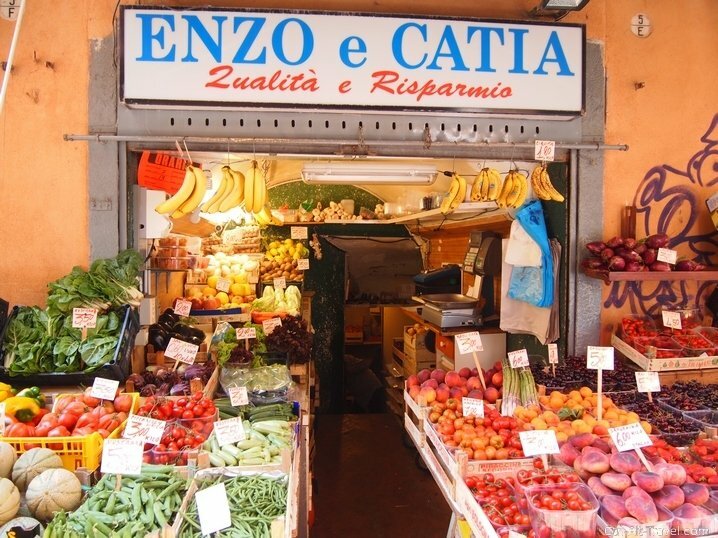 You can buy all manner of fresh vegetables and fruits as well as ham in all forms, fresh fish and even freshly made tortellini. Even in a city overflowing with restaurants and street food, take a night in and try your hand at cooking. With fresh ingredients it is hard to go wrong. Gelaterias are common in the city as well. They range from small shops which a few flavors and the big glass place like Gianni’s under the Two Towers on via Zamboni. 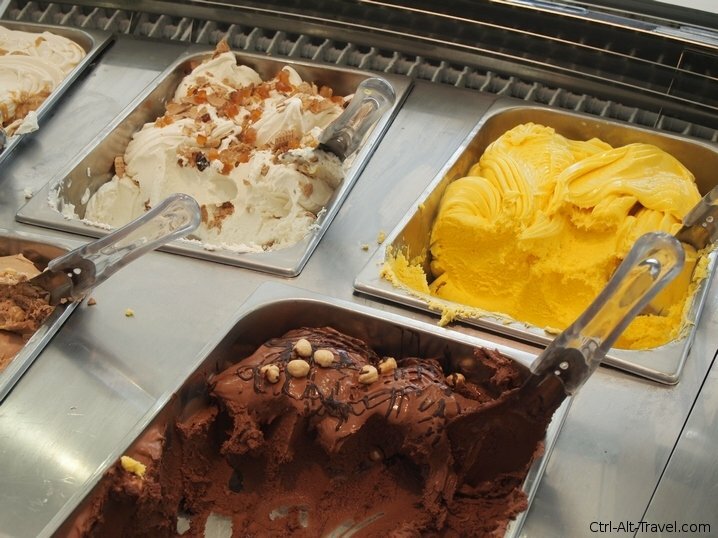 Look for the words Artiginale Gelato, which translates as Artisanal Gelato, which hopefully means higher quality. This is not a town to be trying substandard stuff if you can avoid it. One of the classic flavors is Crema, a yellow color with eggs in it. Also try sorbetto, it is a fruit base with no cream. 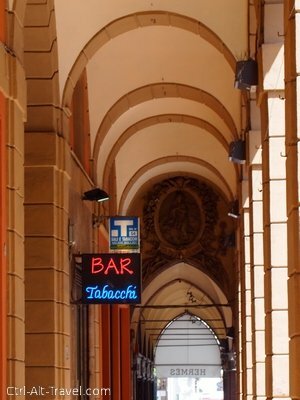 Despite the English cognate, an Italian bar is not where you go out at night to drink. Bars in Italy are open in the morning and are primarily for coffee/cappucino/espresso and the like. They usually have a counter you can lean on and a few tables, though often the drinks cost more if you are sitting at one. Look for a case of croissants (called Cornetto) and other pastries. I have seen Bars with Apertivo drinks and snacks in the evening, but this is not a place to booze it up or have a full meal. The sausage that lends its name to bologna in the US is called mortadella. It is massive. I have seen some only 6 inches across and others nearly 18 inches wide. The main part is smooth pinkish pork, but with chunks of lighter white fat. I have seen it served as slices and as fork bite sized chunks. 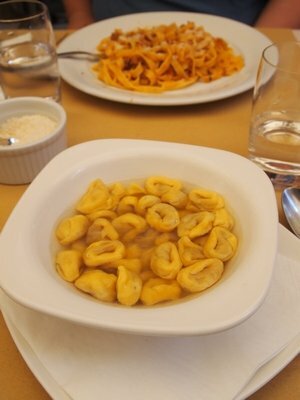 As the largest city of the Emilia-Romagna region, much of the famous foods of other towns are here as well. Parma ham, parmasan cheese and balsamic vinegar from Modena can all be found in the markets of Bologna too. I ran across this group of really tasty pictures of E-R food just today. Here is some idea of what you might pay for food in Bologna. The pasta prices vary the widest and will depend on where you go. In general, the student end of town is cheaper than elsewhere. 3-4Euros for a Piadina at a street shop.